I’ve been a fan of Madhu Kishwars’ writings and I’ve always seen her as an ally in the battle against the agenda of the Indian Feminazis. This book delves deeply into legislation and law enforcement to explore the reason why laws enacted for the purpose of enforcing women’s rights in India end up producing such dismal results. A running theme in the book is the need to adopt a culturally sensitive approach to social reform that respects the aspirations and cherished values of those in whose lives we wish to introduce change. Can you believe that ? Definitely an attempt to harass her. I pulled this from various sites on the net. The most common tactics of interrogation, used by the Indian police, is to beat a confession out of a suspect or intimidate the suspect into signing a confession. My family was subjected to the tactic of intimidation. Among the many indignities heaped upon them, they were made to watch a suspect subjected to third degree treatment in their presence. The Lakshmana Kailas story is a prime example of the interrogation techniques used by the ham handed Indian police. Exaggerating the strength of their case: They tell you that they have recordings, fingerprints, documents, eyewitnesses, etc. All of this may true or all may be false but you simply don’t know because you are isolated. They try and get to you as soon as possible to play on your fears and work that confused state of mind to their advantage. Good cop, bad cop: this is an age-old tactic. The police will work in teams of good cop and bad cop. The bad cop will shout at you and attempt to intimidate you, and may even rough you up. The good cop walks in and will apply the healing solution. He may even yell at the bad cop. Apart from exchanging pleasantries, speak to him about all other things at your own risk. Comparison: They will convince you that they think you are the least to blame for what happened and that, therefore, you will not suffer as severe a sentence. It’s the other guys they are really after and if you cooperate, they will put a good word in for you. Small talk/Chit chatting: What is critical to getting the ultimate admission is to get you talking in the first place – about anything – usually in a “friendly” manner. They will try and find something that you have in common and just have a regular conversation. Then, when you feel comfortable just talking, they will move into the area of the crime. It’s the old story about the frog – try and place him in the boiling pot and he will jump out immediately. But put him in a cold pot and then slowly turn up the heat, he will die before he knows what happened to him. Separation: if the accused, like in most 498A cases, belong to a family, then the family members may be separated and each will be told that the other confessed. Watch out for this. This is the most pernicious tactic in my opinion. Threats And Intimidation: This is the standard operating procedure. The police may threaten to book you under more charges. Wish them the best. These charges need to be proven in court and lies don’t stand up to impartial, intelligent scrutiny. There will threats of physical violence, direct or suggested. Just stand up to it. Promises: They will cut a “deal” with you or “put a good word in” for you. Don’t be fooled. They have no power whatsoever to make deals – only prosecutors can do that and, even then, the judge is never bound by any bargain. Furniture And Spatial Psychology: When in the interview room look out for use of furniture. The power of persuasion is greater when the interviewer removes the barrier of the desk that creates a division of “their” space and “your” space. It is common for the interviewers to touch the suspect in a gesture of support and friendship. If the interviewer is on the opposite side of the table, such a gesture is limited. You best defense is to SHOW NO EMOTION. The whole atmosphere inside a police station is geared towards creating an environment of stress so as to break down the suspects morale. It is easy to accept the hand of friendship in such a situation, DON’T break your silence. You, as the suspect, will have your back to the door. This is done to make you feel apprehensive each time someone comes into the room. In addition, the seat for the solicitor will be out of your eye line. The interviewer will often fall silent, putting pressure on you to fill in these “pregnant pauses” – maintain your silence. Expressions Of Approval: Look out for expressions of approval, both verbal and non verbal. Verbal: “That’s good”, “Yes, go on” and “I like that approach”. Non verbal: smiling, nodding, looking at a fellow interviewer as if to say “She’s/he’s right you know.” These are all indications of the frame of mind of the interviewer. You may be offered compliments e.g. “You’re no fool”, etc. Non verbal compliments such as a little shake of the head as if to say that I admire you for saying that. The principle behind all this is to make the suspect feel good and to encourage further dialogue. Have your lawyer with you at all times and maintain your silence. The right against self incrimination is a fundamental right. The police cannot torture you or extract a confession out of you either. This is illegal and if they do so, they are in contempt of the many judgments of the Supreme Court in this regard. 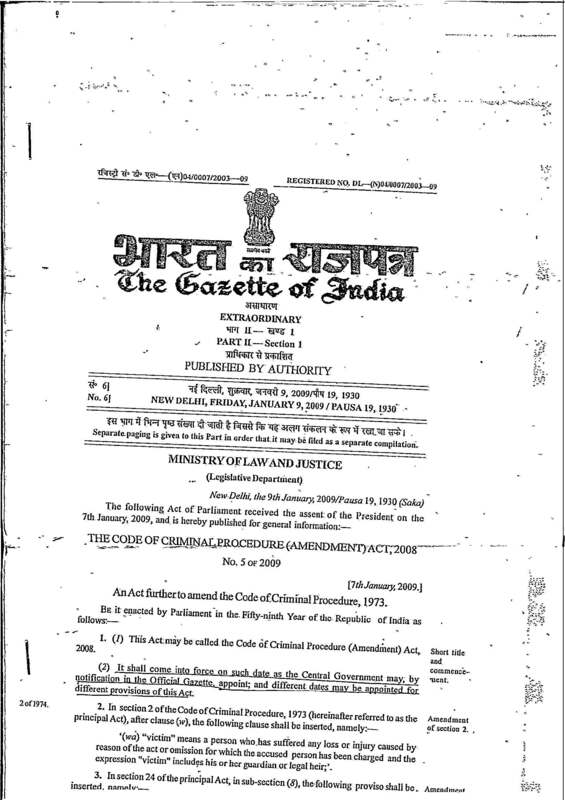 Here is a pdf that explains the rules governing jurisdiction of cognizable offenses (498A cases). Here are a couple of the judgments of Justice Dhingra where I pulled all this information from. I couldn’t find the Satvinder Kaur Judgment, but here is another judgment on jurisdiction by the Supreme Court, the Ajith Abraham case (Chennai). This is an old news item, but very revealing as no one talks of amending the law to prevent its abuse as weapon of vengeance or a tool of extortion.